Summary: 33 Mine workers are trapped inside the San Jose gold-copper mine in Atacama, Chile. The worried family members are protesting outside, attracting the media attention. 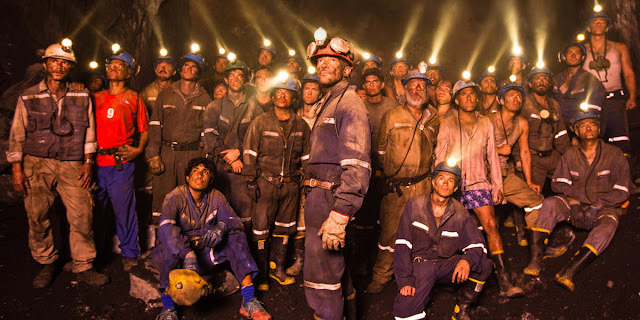 Would the government come up in rescuing these miners from an inefficient mining company? Our times is replete with disaster dramas. There would be only a few Cast Away (2000) even fifteen years ago. Did the situation change, symbolically, after the market crash of 2008? The collective is at stake with survival issues. 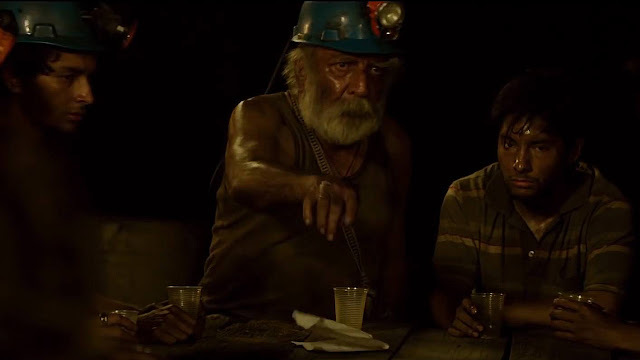 The Mexican film director's new film, concerning 33 miners trapped under the soil, in a collapsing copper mine on the Andes, is a high adrenaline drama that brings the audience face to face with the complex interactions between people and their governments. The San jose copper-gold mine in the Atacama region in Chile experienced severe collapse and entrapment of 33 mine workers in reality, in 2010. Several of such miners came back from retirement with the hope of an extra income. What they faced, inside the earth, was the promise of death in an unstable, wrongly worked out mine centered around an equally unstable mountain ridge. 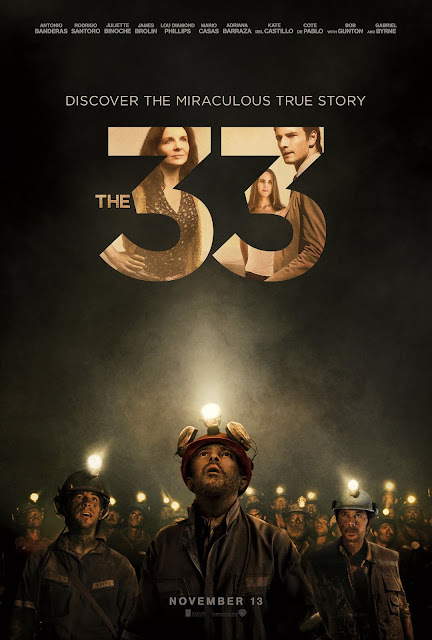 Once the mine collapsed partially, it became a public issue, thanks to the miners' families outside. Chilean government stepped in, out of the vote-bank considerations as well as the morality question before its own citizens and the world at large. Several media used the sensational story for their business, with live feed from the site. The disaster became a commodity to sale once a solution was found out and the miners inside could be communicated. Made on a simple design, the 200 storey underground (3300 ft) is shown mostly in tele lens on a tripod or steadicam, for the intensity of the emotion brewing out in the trapping zone, in contrast with the open mountain desert above where the worried family members are in continuous strife against the mining corporations security guards and government officials recorded in handheld camera, often with wide angle lens. The drama of the surface and the bottom has several layers of each, individually. As the young mining minister takes up the authority of rescuing the miners, and succeeded in communicating with them after an initial boring, the up and the down are further differentiated between the leadership challenges and its associated sound, and silence, for the miners, and the introduction of carnavalesque music for the changing mood above. Day by day, like a journal, the miners faced both physical, and linked psychological challenges with depleting food and water. Day-dreaming, almost like mass hysteria, engulfs them - injecting them with carnal wishes - food, relationships, comfort. There is the crisis of survival in the air, the point of sharing food, and trust. There is no option for high philosophy, and politics, in such conditions. There are little dollops of many things, in the sustained crisis. Racism, leadership, commodification, reconciliation of estranged siblings, meaning of responsibility and the power of the collective. The Director succeeds to keep the wire alive throughout the film - the high-intensity drama lives a properly rounded life till the end of the movie.